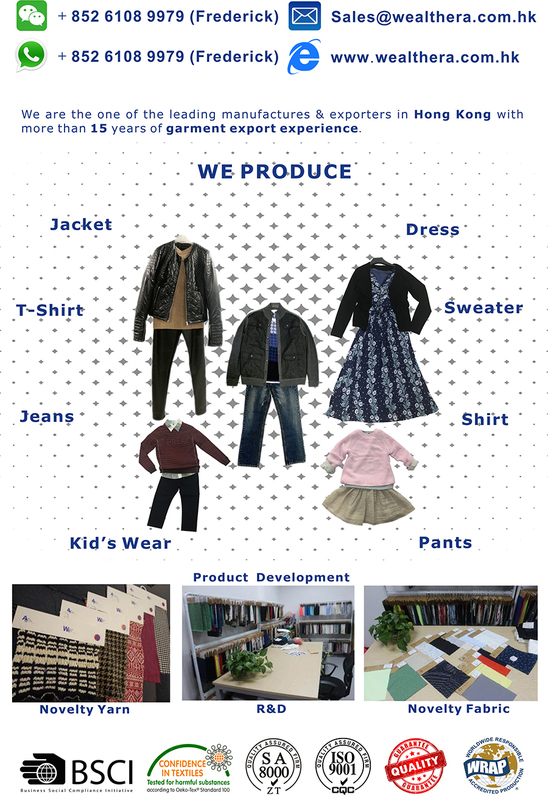 We are the one of the leading manufactures & exporters in Hong Kong with more than 15 years of garment export experience. We produce various types of garments with technique in embroidery, print, heavy laundry effect in woven and knit items to Europe, USA, Canada and Oceania Country. We have own vertical set up from yarn spinning, weaving fabric to garment manufacturing. A series of garment manufacturing facilities, it can be provided a full range of apparels not only purses in high quality but also at competitive price. Small order with flexible MOQ material & short delivery orders are welcome. Our facilities are awarded "BSCI", "WARP", "SA8000", "ETI" "ISO9002" and "Oeko-Tex standard 100" under conduct of social compliance and environmental protection. Woven Workshop: Auto Spreading, Dail Cutter, Band Knife, Computer Sewing Machine, Buttoning and Button-Hole Machine.